Practically invented in the Florida Keys flats fishing for bonefish has captured the hearts and minds of anglers the world over. Some of the most legendary of fishing guides in the world of fishing were bonefishing guides. Combining the best of both hunting and fishing, bonefishing offers the true sportsman the opportunity to do both. Traditionally a sight fishing sport. 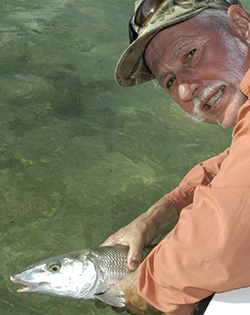 The super weary bonefish are fished for on the shallowest of flats in the Backcountry waters of the Florida Keys. A professional flats fishing guide is required for a successful day at this technical way to fish. Not on the "Eat Me" list of fish species here in the Florida Keys the bonefish is strictly a sport fish and harvesting them at all is illegal. We practive catch and release only for bonefish. Our fishing guides use technical flats fishing boats that carry 2 or less for bonefishing. 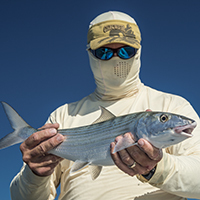 Use a fly rod or spin fishing tackle to pursue the bonefish. Your fishing guide will silently push the boat into position for you to make your cast to targets. 4, 6, and 8 hour trips are available every day for bonefishing with one of our guides. The best months for bonefishing start in April and progressively get better through to the end of October. Rates start at 450 for a half day for 2 persons or less. Some experience might be necessary to be successful at bonefishing. Live bait / spin fishing is the easiest way to fish for them and offers the most hook up chances. Our Florida Keys fishing charters also offer fly fishing upon request. Best months for bonefishing are March, April, May, June, July, August, September and October. To make a bonefishing guide reservation the best thing to do is call us directly. There are many variables in this type of fishing charter and by interviewing you over the phone we can set you up the right way with the right boat and guide in a location near where you will be staying. We are always here standing by to help you put your Florida Keys fishing charter together.